Regularly trained installers; with up-to-date knowledge of new improvements to the Vaillant boiler product ranges. Direct product support from the manufacturer; due to the fact that we have a direct link to product and customer support. We complete the guarantee application for you for extended guarantees free of charge; starting at 5 years for the ecoTEC Pro and 7 years for the ecoTEC Plus. Gregory Heating and Plumbing Ltd are Gas Safe trained and registered Boiler Installers. In basic terms, this means that your gas appliance is installed safely to the correct standard and we notify the Gas Safe Register for you on completion. You will then receive a Gas Safe Certificate, through the post from them, for you records. 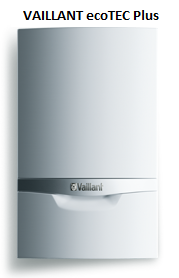 We fit all domestic gas fired boilers within Vaillant’s range of high efficiency condensing combi, regular heat-only and system boilers; which can help our customer’s improve their household central heating efficiency. In particular we focus on the Vaillant ecoTEC Pro and Plus product ranges; which have the following basic distinctions. The ecoTEC Pro is Vaillant’s entry level combination condensing boiler in the 24 to 28kw heat output range. They share the same build quality and high efficiency; but the ecoTEC Plus built-in controls have greater functionality and come to a higher specification. We install the ecoTEC Pro boiler with a 5 year parts and labour guarantee due to our membership of the Advance Scheme; compared to the 2 year standard guarantee. 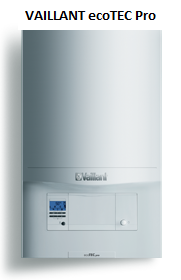 The ecoTEC Plus is Vaillant’s flag ship range of gas fired high efficiency condensing boiler. It comes in Combination, Regular Heat-only and Systems Boiler configuration. It builds on the features of the ecoTEC pro range by having an improved user interface, excellent efficiency, an enhanced visual appearance. We install ecoTEC Plus boilers with a 7 year parts and labour guarantee on the Advance Scheme. Gregory Heating and Plumbing Ltd offer a mechanical power flush service for domestic central heating and underfloor heating systems. In particular we recommend a power flush when fitting a new high efficiency boiler to an old system; which will help protect it from many years of sludge and corrosive build up within the system.